One of the things I love most about May—indeed about spring—is how it is a month of firsts. Item (to borrow from Shakespeare): First hermit thrush singing its pan-pipe song. Item: First hummingbird whizzing past the shrubs in front of the house. 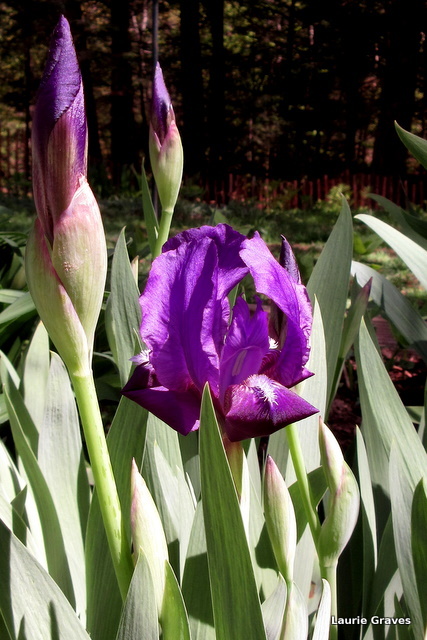 Item: First Iris bloom in its rich purple glory. 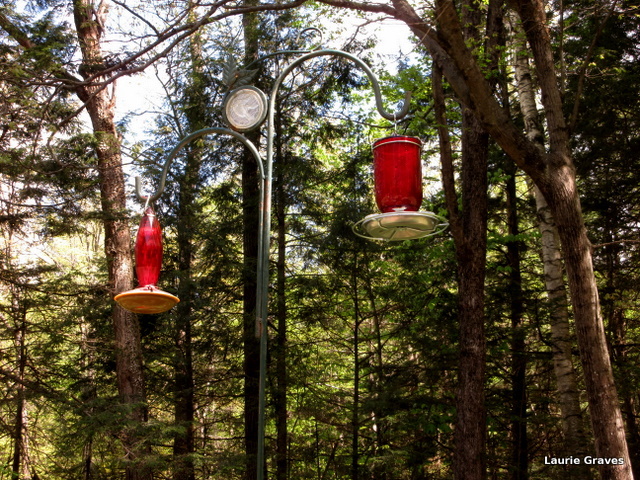 After the first sighting of the hummingbird, I figured it was high time to get out the hummingbird feeders—the one on the right I bought new this year. In a pan I mix one part sugar to four parts water and let it boil then cool before filling the feeders. So far there haven’t been any visitors, but soon there will be. Yesterday temple dog, aka Mei Ling, came out for the first time to guard the garden. She takes her job very seriously, and this year we added a little solar light to help her with her work. Her turtle friend Terrance also keeps watch. Today, more garden ornaments will be coming out, and I will continue my task of sprinkling ash and organic fertilizer on the beds. Next comes the compost, which we get at our transfer station, and this adds a rich cover to the dirt. There will be more firsts. We haven’t heard the first loon call or seen the first fireflies or heard the first thrum of June beetles against the screens in the windows. No dragonflies yet. Or butterflies. But soon these things, along with other new blooms, will be coming. And I’ll be waiting with camera, pencil, and notebook. Yes – the joy of those first sightings that tell us Spring has come! Those purple Irises are beautiful! Thanks, Carina! They are one of my favorites. Just why I love May – everything fresh, new and exciting. If you blink, you might miss something! Eliza, you are so right. Despite the blackflies, May is my favorite month. The joy of mid-spring! I enjoyed this post. The gorgeous Iris, the Hummingbird Feeder. And your garden friends too. Thanks, Cynthia, for the kind words. I have Iris envy. Ours haven’t even budded up. On the other hand, the hummingbirds seem to be hanging out in our neighborhood. 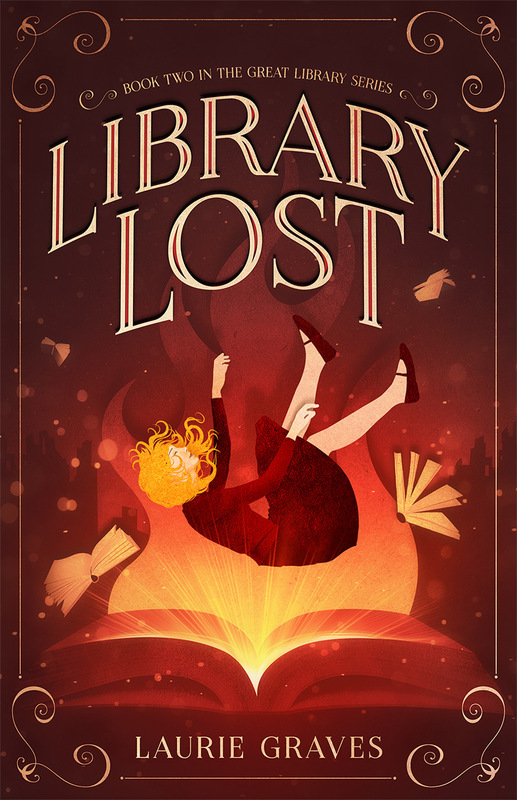 They showed up last week–unexpectedly. During an early morning watering of my hanging baskets, I was buzzed by a shiny little male. So, I put out the feeders. Within a few hours, he was at them. A second fellow came soon after and they were so pitiful during the cold snap on Sunday/Monday. They huddled on the branches near the feeder and took turns feeding. Now that it’s warmer they’re becoming a little combative. Aaahh. All the delightful firsts of spring. 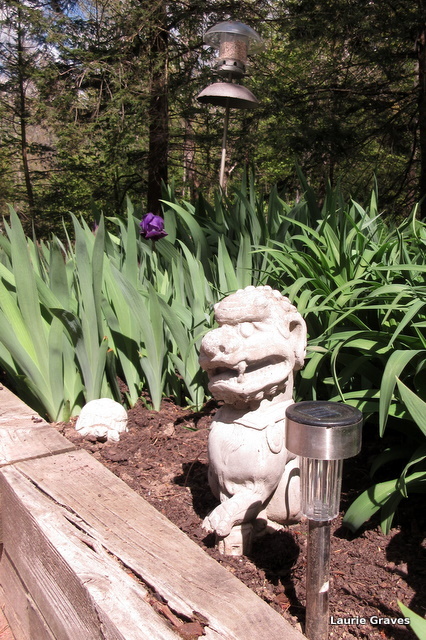 Soon you will have Irises. My little purple ones are an early variety. Nice to hear the hummingbirds have made an appearance at your house. We had a visitor, too, and at the new feeder. Yippee! I love all the firsts of spring. I’m jealous of your hummingbird sighting, we haven’t seen them here yet. Jason, I’m sure those hummingbirds will be there soon. How wonderful that you can get compost at your transfer station. I wish all would do that. Yes, very environmental and also very reasonably priced. I couldn’t get the compost cheaper anywhere else. Win, win!